At the beginning of this legislative course, we remember brothers of ours who should have been with us under the roof of this parliament taking part in this great national workshop, but the bullets of treachery prevented them from doing so. They fell martyrs merely because they were determined to shoulder national responsibility by putting themselves forward as candidates for the elections of the People's Assembly; and so they haven't been able to share with us this historic day. In respect for their souls and the souls of all innocent civilian martyrs and military martyrs who fell since the early days of these events, we stand with great veneration and send their families our love and say to them that their blood was not spilled in vain. I am not saying this to indicate seeking revenge but in terms of upholding right because a right is never forgotten unless it is forfeited by its owner. Our only solace – and here I'm not only offering condolences to their families; I am rather talking about the larger Syrian family – is that our country will be once again sound and healthy and that the children of this homeland will enjoy security, peace and stability. It gives me pleasure to congratulate you on the trust the people has put in you, and to particularly congratulate the new members who have joined this national institution to provide new blood and creative ideas which renew and invigorate the homeland and which fulfill the Syrians' aspirations in a safe and prosperous future. I highly appreciate your determination to take part in these elections under the critical circumstances which require more courage, perseverance and a high sense of responsibility. This is only evidence of your willingness to give and to sacrifice at a time where many individuals toil under national responsibilities which are only shouldered by those who believe in the sacredness of national work and those who have committed themselves to serve the people and defend it. The People's Assembly is an Assembly for all the Syrian people. It is the Assembly of the farmer dreaming of getting better crops and a better future. It is the Assembly of the peasant sweating to feed his children and extended family. It is the Assembly of the public sector employee taking his children to school to ensure a safer and more stable and prosperous future for his children. It is the Assembly of the soldier sacrificing his life in defense of his homeland. It is the Assembly of the intellectual, the educated, the doctor, the engineer, the lawyer, the journalist, the worker. It is the Assembly of the women who have always contributed to the development and progress of Syrian society. It is the Assembly of the people from whom it takes inspiration and for whom it lives, legislates and oversees the performance of the executive authority. DAMASCUS, (SANA)_ H.E. 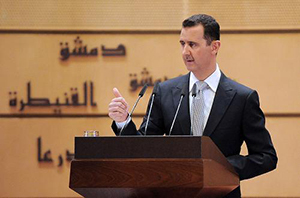 President Bashar Al-Assad delivered on Tuesday before noon a speech at Damascus University Auditorium covering domestic issues in Syria as well as local and regional conditions' developments. President Al-Assad reiterated in his speech Syria's determination to continue the ongoing process of reforms, whose results are known before hand, citing some of the measures and steps taken to this effect including the abrogation of emergency law, authorization for parties, local administration elections, information law, elections law, and the under-discussion anti-corruption law. President Al-Assad declared that the new constitution is to be soon put into popular referendum, citing some aspects of the constitution as to include 'political and party pluralism', 'the people are the source of power especially through elections'. The second to none priority for Syrians is the restoration of security and fighting terrorism with an iron fist, outlined President Al-Assad hailing the Syrians' steadfastness and awareness. The President spoke of the Syrian long experience with elected parliaments, parties highlighting the Syrian Arab role in the Arab League, whose Arabism is to be suspended without the participation of Syria, in reference to the decision taken by the League of Arab States to suspend Syria's participation.